The sun sets on another Thanksgiving. It will go down as the strangest ever. Someone else planned the menu, shopped for the groceries, cooked them up in a pan and served them at 3 p.m. sharp. What made it strange and wonderfuI is that I did not lift a finger. Confirms my original suspicion that men are better cooks than women (when they want to be). Most of my cooks today were of the male gender and when they began to clean up the mess in the kitchen, I almost went into cardiac arrest. Of all the lessons I’ve learned in life up till now, the most useful is that the practice of offering Thanksgiving shifts your energy instantly to a better place. This practice alone will shift your energy from where you are to where you want to be. There is nothing more powerful, or more effective at bringing happiness into our world, than to start by being thankful for where we are right now. Often, even dire circumstances carry a silver lining. As we enter into this beautiful holiday season let’s remember to practice gratitude every day, not just on Thanksgiving. Let gratitude be the first thing on your mind when you wake in the morning, and the last thought you have as you drift off to sleep each night. Thanks to all for the beautiful comments on my resent setback. I just had the opportunity to catch up.. All I can say is Wow. I never realized how deeply we care about each other even though our paths may cross only sporadically. From the bottom of my heart I thank you. I’m feeling pretty upbeat about this thing, and now I know why! 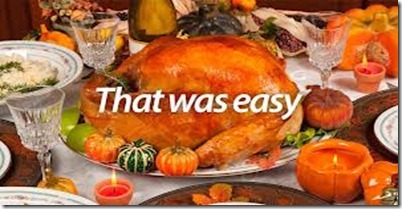 Now I’m going to choke down my Thanksgiving dinner – a bottle of Ensure. Then WIlliam and Braddock want to kidnap me and drive out to Wal-mart to watch the demonstrations. Love and prayers being lifted up for you for a quick & complete recovery. I’m grateful today that you are back home and had so many willing to cook you up a great Thanksgiving. Your words are true and hopefully we will all do as you suggest. Just remember that you are greatly loved and appreciated. Your humor lifts us all up. So great to hear from you today!! And as usual, you have precious words that inspire us. Hope you feel up to following the great game today!! Praying for your strength and complete recovery! So glad you are home. You are in our prayers . Appreciate your reminder to wake up giving thanks every morning. Keep that pretty chin up. I knew you would have a wonderful Thanksgiving dinner and I am not surprised that the boys could turn out an amazing meal. They are your children. If they had not been able to pull this off, I believe your traveling partners would have your back. You are much loved by many..
Emily, you’ve been in my prayers and will continue to be for complete healing. So glad to hear from the “Deluded Diva”! You are my hero! ♥ Praying for you! Diva – so glad that the “bump in the road” hasn’t derailed your spirit or your quick wit. I give thanks every day for knowing you and for the blessing you are to your friends.